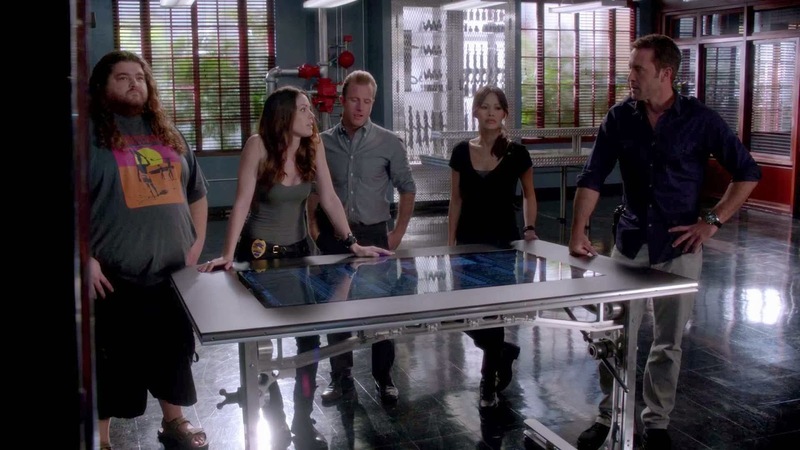 Anybody Planning on Celebrating #100 #H50 Tonight? I Say Let's Party! 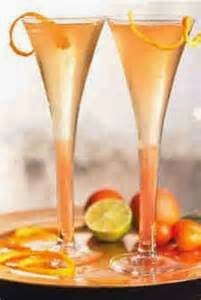 Now no party would be complete unless we have some signature cocktails to get the party started.. Sure you might want to crack open a few beers, have a glass of wine but for the adventurous types (and I know who you are) here are just a few things to get the night started off right. I hope that you all have some plans for this evening me, I going to throw a few things together mix a cocktail or two and maybe just kick back and enjoy some great times with some great people. Hopefully you might do the same and maybe just maybe there just might be something you might find for your viewing party pleasure. 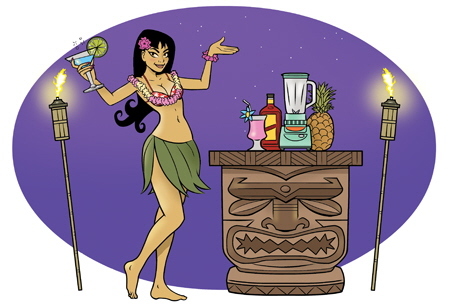 Blend with 4 cups crushed ice and pour into large (tiki) bowl. Add ice cubes to fill. Garnish with a flower. 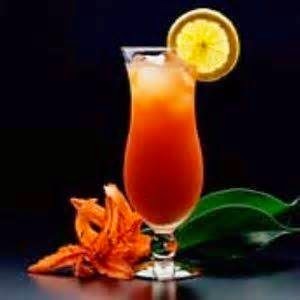 Fill a glass with ice add vodka and schnapps fill with orange juice. Add liquors to a cocktail shaker half-filled with ice. 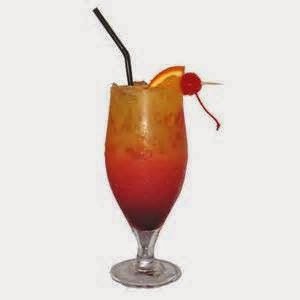 Shake and strain into an old-fashioned glass, top with soda, stir briefly and serve. Mix ingredients in a shaker, then pour into a shot glass. Top off with a cherry if desired. Add Rum and Schnapps to glass and stir quickly. Then add ginger ale and several ice cubes until glass is nearly full. 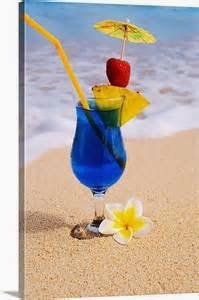 Then slowly pour in Curacao and watch this cocktail turn blue like the waters of the south Pacific. Combine in shaker over cracked ice, stir and strain into a cocktail glass. 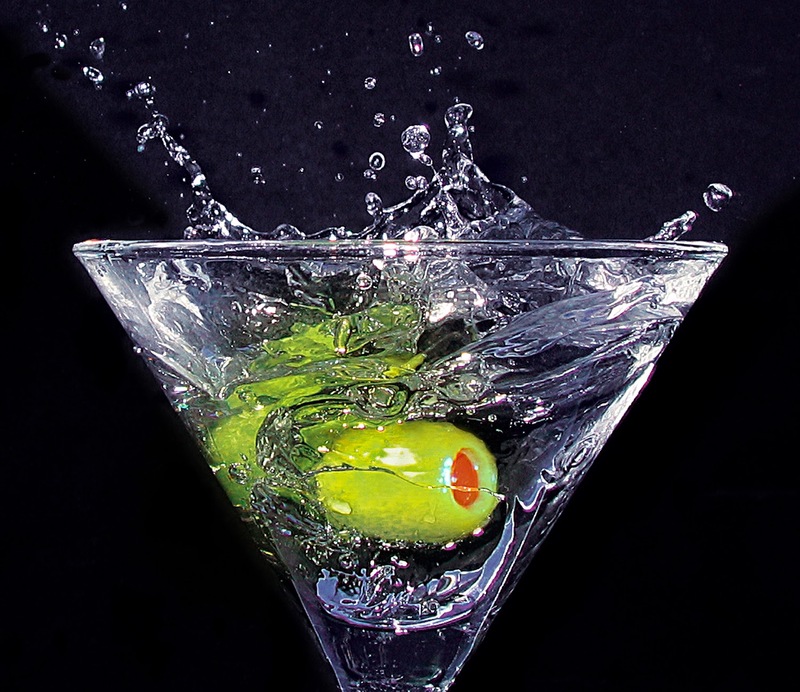 Optionally, garnish with an olive or two or a twist. Add the ingredients to your cocktail shaker with cubed ice and shake briskly for about 10 seconds. Strain and pour into an ice filled Sling glass and top with Soda Water. Drip Angostura Bitters on the sugar cube and place in the bottom of the glass. Cover cube with Cognac, then top up with Champagne. 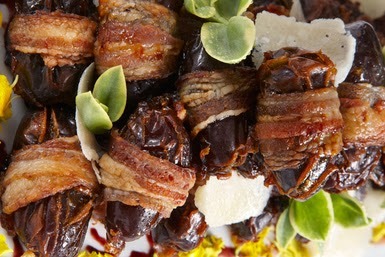 Stuff 1 piece of cheese into each date, then wrap 1 piece of bacon around each date, securing it with a toothpick. Arrange dates 1 inch apart in a shallow baking pan. Bake 5 minutes, then turn dates over with tongs and bake until bacon is crisp, 5 to 6 minutes more. Drain on a paper bag or parchment. Serve immediately. Saute wieners in barbecue sauce and maple syrup until heated through. Cool for 5 to 10 minutes. Separate crescents into triangles. Cut each triangle into 4 wedges, making 4 very thin, long triangles. 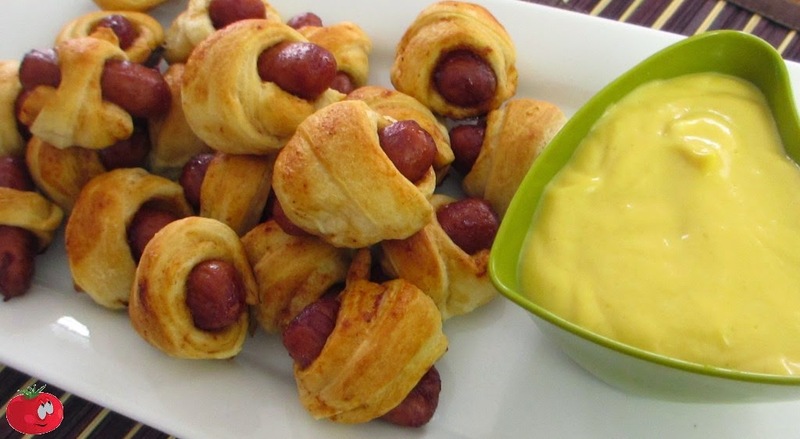 Wrap one triangle of dough around each cocktail weiner and pinch the ends to seal. Arrange on ungreased baking sheets and bake at 350º until golden, about 10-12 minutes. Place olives, Parmesan cheese, and garlic (if using) in a food processor. Add olive oil slowly while running. Process until smooth. Take 2 large eggplants, puncture them with a fork in several places so that they will not burst open when baked. Place them in the oven at 350° and bake until soft. Chop onions and fry in oil, mix with masked eggplant add tomato paste, salt, a little vinegar and sugar to taste. Cook 10 to 15 minutes. Use as spread. In small saucepan, saute onion in oil until transparent. Add tomato juice, brown sugar, vinegar, and cayenne; bring to a boil. Lower heat and simmer sauce, uncovered, 10 minutes. Wash potatoes (leaving skins on), cook in small amount boiling salted water until tender, then drain. Seed and cut green pepper into 16 pieces. Cut each onion into 4 wedges. Alternate potato, green pepper, Spam, mushrooms, and onions on long skewers. Place on broiling pan; brush with barbecue sauce. Broil at least 3 inches from heat source 15 minutes, turning and brushing with sauce after 5 and 10 minutes. 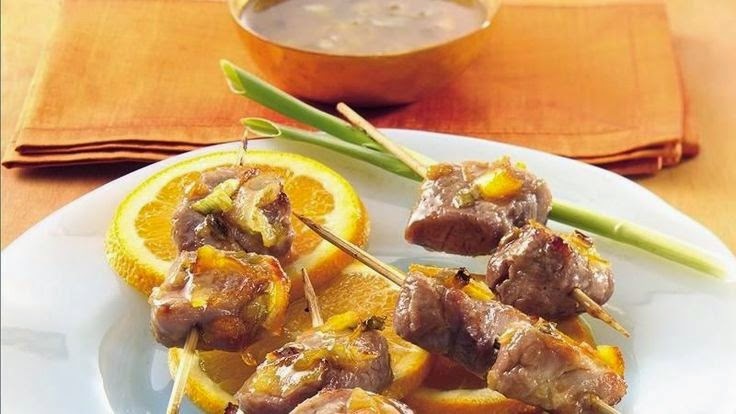 In small bowl, mix all ingredients except pork and skewers. Place pork cubes in resealable plastic food-storage bag. Pour half of the marmalade mixture over pork; seal bag. Refrigerate 2 to 3 hours, turning bag occasionally. Refrigerate remaining marmalade mixture to use as dipping sauce. Meanwhile, soak skewers in water 30 minutes to prevent burning. Set oven control to broil. Line 15x10x1-inch pan with foil or cooking parchment paper; lightly spray foil or paper with cooking spray. Remove pork from marinade. Discard any remaining marinade. Thread 2 pork cubes on end of each skewer. Place in pan. Broil with tops 4 to 6 inches from heat 5 minutes. 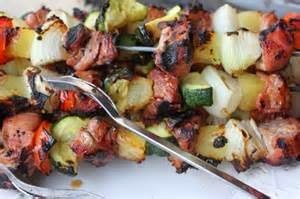 Turn skewers; broil about 5 minutes longer or just until pork is no longer pink in center. Meanwhile, heat remaining marmalade mixture in 1-quart saucepan over medium heat, stirring occasionally, until bubbly; use as dipping sauce. Soak 8 small wooden skewers in water for at least 15 minutes. In a large bowl, toss the chicken, onion, and orange with the oil, orange juice, cumin, cayenne, ¾ teaspoon salt, and ¼ teaspoon black pepper; let marinate for 20 minutes or up to 2 hours. Thread onto the skewers. Cook the rice according to the package directions. Remove from heat, then sprinkle the zucchini over the rice, cover, and let stand 5 minutes. Fluff the rice with a fork and fold in the zucchini. 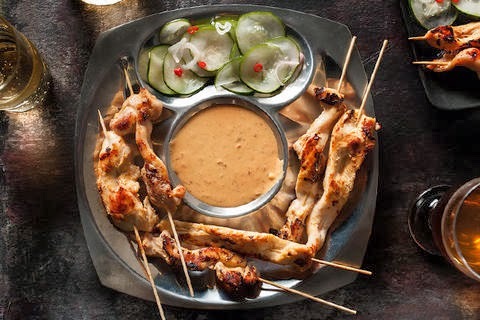 Heat a grill or grill pan to medium, lightly oil the grate, and grill the skewers, turning occasionally, until the chicken is cooked through and the onion is just tender, 15 to 18 minutes. Serve over rice. Peel, core and thinly slice apples, and sprinkle with nutmeg. In non-stick skillet, heat oil over medium-high heat, then add pork chops, salt and pepper. After about 5 minutes, turn chops to brown other side. After 5 minutes, add apples and cover. Lower heat and simmer another 5 to 10 minutes. Thickness of chops will determine cooking time; center of chop should be white, and juices should run clear. Remove chops from pan to a serving plate. 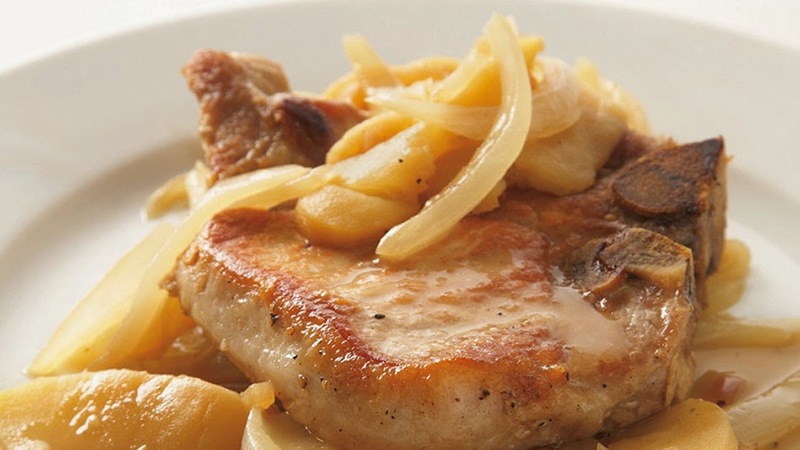 Pour in juice or cider, turning up heat as you stir juice and apples, then spoon onto pork chops. Peel and slice potatoes in rounds, mix with the beaten egg, the milk, salt, pepper and nutmeg. Add half the cheese mix well. Arrange in baking dish which has been rubbed with garlic and buttered well. Dot with butter generously and sprinkle with rest of cheese. Bake in moderate oven (350°) for 1 hour or until the potatoes are done. Drain pineapple, reserving juice and 1-1/2 cups pineapple. In a large bowl, combine 3/4 cup reserved crushed pineapple, pepper and salt. Crumble beef over mixture and mix well. Shape into 18 patties; place in two 11-in. x 7-in. dishes. In a small bowl, combine the soy sauce, ketchup, vinegar, garlic, pepper flakes and reserved pineapple juice. 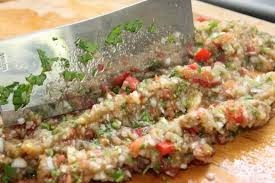 Pour half of marinade into each dish; cover and refrigerate for 1 hour, turning once. Drain and discard marinade. Lightly coat the grill rack with oil, grill patties, covered, over medium heat or broil 4 in. from the heat for 4-5 minutes on each side or until juices run clear. 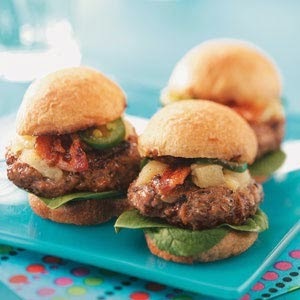 Grill buns, uncovered until toasted, serve burgers on buns with spinach, remaining pineapple, bacon and jalapeno peppers if desired. 1. Sprinkle eggplant slices lightly with salt and pepper. 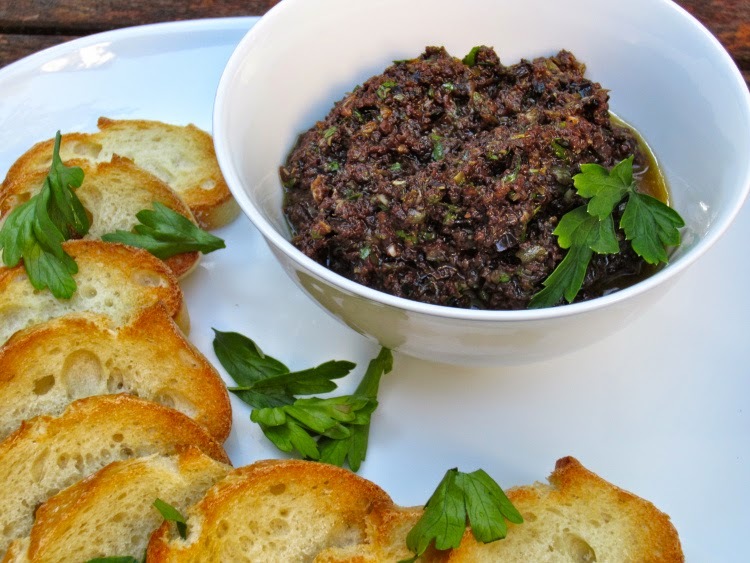 In a small bowl stir together olive oil and garlic; brush on both sides of eggplant slices. In another small bowl toss together Parmesan and mozzarella cheeses; set aside. 2. For a charcoal grill, grill eggplant slices on the rack of an uncovered grill directly over medium coals for 5 minutes. 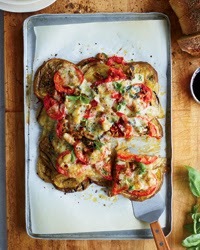 Turn eggplant slices and sprinkle with half of the cheese mixture. Top with tomato slices and the remaining cheese mixture. Cover and grill for 2 to 3 minutes more or until eggplant is tender and cheese melts. (For a gas grill, preheat grill. Reduce heat to medium. Place eggplant on grill rack over heat. Cover and grill as directed.) Before serving, top with shredded basil. 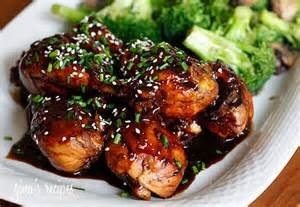 Whisk the vinegar, honey, soy sauce, toasted sesame oil, chili garlic sauce, garlic, and salt in a bowl until smooth. Pour half the marinade into a large plastic zipper bag; reserve the the rest for the sauce. Place the chicken thighs into the bag with the marinade, squeeze all the air out of the bag, and seal. Shake a few times to coat chicken; refrigerate for 1 hour, turning bag once or twice. Preheat grill, pour the other half of the marinade into a saucepan over medium heat, bring to a boil, and cook for 3 to 5 minutes, stirring often, to thicken sauce. Remove the chicken from the bag; discard used marinade. Place chicken thighs onto the grill, and baste with reserved sauce. Grill, basting one more time after 10 minutes; cook until instant-read thermometer inserted into a chicken thigh should read 165 degrees F approximately 25-30 min cooking on med heat. Let stand for 5 minutes; and bring remaining marinade back to a boil for 1 or 2 minutes, and serve with chicken. Sprinkle with green onions. Prick each sausage a half-dozen times with a needle or pin, arrange the onion slices on the bottom of a sauté pan just large enough to hold all the sausages. Place the sausages on top and add beer and water to cover (the ratio should be about 3 parts beer to 1 part water). Place the pan over medium heat and gradually bring the liquid to a simmer, not a rapid boil. Poach the sausages until half-cooked, 4 to 5 minutes. Preheat grill to medium-high. Dice and combine all the ingredients for the Mango salsa, Toss and set aside. In the food processor, puree the pineapple chunks, garlic and dijon mustard until smooth. Open the buns and grill face-down for 1 minute. Remove from heat. Grill the sausages for 5-8 minutes, rotating for even char marks. 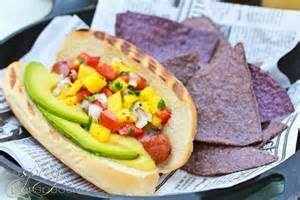 Place the sausages on the buns and top with mango salsa, and pineapple mustard. In 2-quart saucepan, add 1/2 inch water; heat to boiling. Place potatoes in water. Cover tightly; return to boil. Reduce heat; simmer 15 to 20 minutes or until potatoes are tender. Meanwhile, in small bowl, mix dressing ingredients with whisk. In large bowl, combine cooked potatoes, pecans and raisins; pour dressing over potatoes. Toss gently. Serve immediately or refrigerate until ready to serve. Melt butter over medium heat and stir in flour, making a rue. Add milk with a wire whisk and continue cooking until thickened. Add salt and pepper, then cheese. 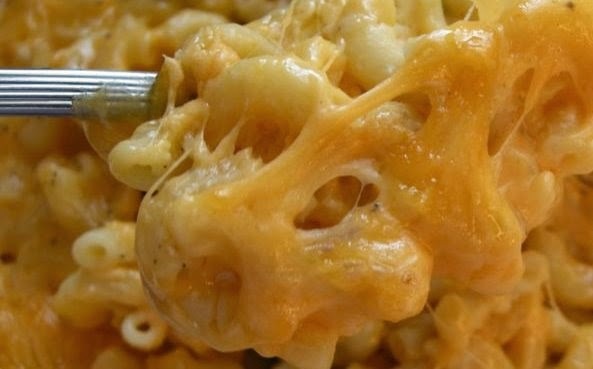 Stir until cheese is completely melted, then pour over over hot pasta and serve. Cook corn as directed on bag. Rinse with cold water; drain. In large bowl, stir together corn and remaining ingredients except avocado. Refrigerate until ready to serve, at least 1 hour. Stir in avocado just before serving. Cut beans in half if desired. In 2-quart microwavable casserole, place beans, potatoes and water. Cover and microwave on High 10 to 12 minutes, rotating dish 1/2 turn every 4 minutes, until potatoes are tender; drain. 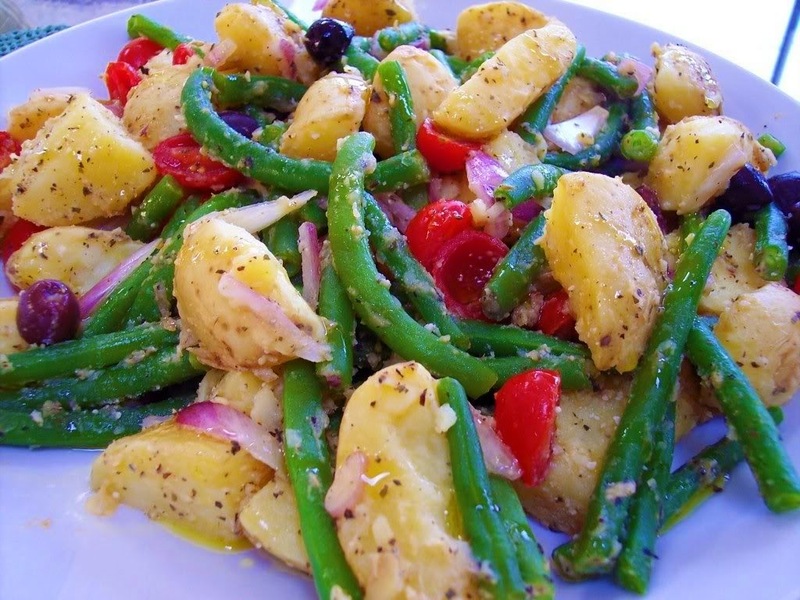 In large glass or plastic bowl, toss beans, potatoes and dressing. Add onion and olives; toss. Cover and refrigerate 1 to 2 hours or until chilled. 1. In a large bowl combine peaches, granulated sugar, lemon juice, tapioca, cinnamon, ginger, and salt. Place half of the peach mixture in a 2-quart disposable foil pan. Drizzle the 1/3 cup caramel topping over the peaches in pan. Top with remaining peach mixture. Cover pan tightly with foil. 2. For topping, in a medium bowl stir together crushed pretzels, brown sugar, and flour. Using your fingers, work in butter until mixture resembles coarse crumbs. Set aside. 4. Remove foil pan from grill. Cool on a wire rack for 20 minutes. 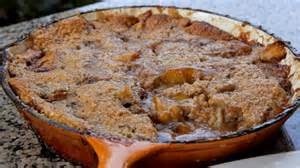 If desired, drizzle cobbler with additional caramel ice cream topping and serve with vanilla ice cream. In a small saucepan, combine the gelatin, pineapple juice and egg. Cook and stir over low heat until mixture is slightly thickened and a thermometer reads 160 (do not boil), about 10 minutes. Remove from the heat; transfer to a bowl. Cover and refrigerate for 30 minutes, stirring occasionally. 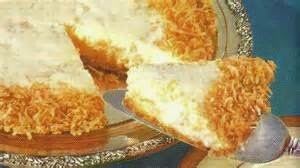 Fold whipped cream into filling. Spread evenly into crust. Refrigerate for 4 hours or until set. When it comes to food, you can feel free to mix it up and just have fun. Have a theme or go wild like I did here, what ever you may choose the prime objective is to enjoy the fruits of your labor. If you make any of the recipes take a picture and share it with me either here or on Twitter @cherylhofmann or by email cherylsrecipe@yahoo.com. I will share them here with everyone. Erin go Bragh 5-0 Style, What Else Would You Expect? Top of the morning my friends, well since I really did not know what to do for St. Patty's Day, I thought I would go back into the archive and pull out a goody for you. This may be from 2012, but heck if 5-0 can repeat this week, why can't I? I do hope you enjoy! 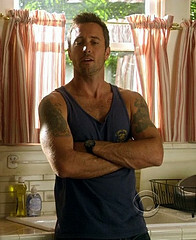 Steven has taken to task to try to show off maybe some culinary ability as well, while making a proud display of the McGarrett family heritage. There may have been jokes about the reading material that could be found at Steve's bedside, The Joy of Cooking may not be among them, but rest assured I think I can give him some pointers if needed. It is St. Patrick's Day , and even though we have played with some Italian food, YOU DO NOT MESS WITH THIS DAY! 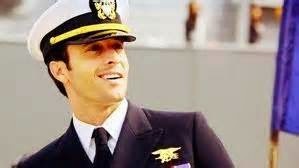 So our dear Commander will have some friends over offer some Gaelic fare to warm the heart and fill the stomach. If that does not work just make sure there is enough beer on hand. Time to get in the kitchen and start showing off those Zen Master skills. In a large heavy pot or Dutch oven, place the corned beef. Add the 1cup each of chopped onions and carrots, vinegar, beer, and all the seasoning packet. Add enough water to over the corned beef. Bring to a boil, cover, and simmer about 3 hours until meat is fork-tender. Once the meat has cooked for the 3 hours, add the remaining onions and carrots, and red or white potatoes, and cabbage to the cooked corned beef. (Placing the cabbage in last so it is on top.) Cover and simmer about 20-30 minutes, until potatoes and cabbage are fork-tender. To serve, always cut corned beef against the grain into thin slices and accompany with the cooked vegetables on a large platter. It would appear that the corned beef is off to a mighty good start. 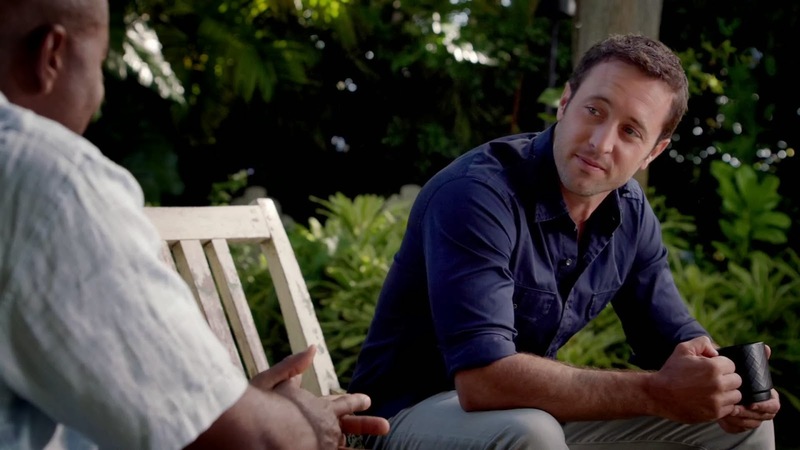 There is some distinct possibly that McGarrett actually may be getting a handle on this and enjoying himself. Am I right Steve? Oh and it serves up amazing! Anybody want some? This next recipe is not the typical fare, but adds a nice twist to the typical ingredients. Chop the cabbage into quarters and remove the core. Cut each quarter into 1/2 inch wedges. Slice the onion into 1/2 inch wedges as well and separate the layers of both. Toss the cabbage, onion, bacon, and olive oil together in a large bowl and pour into a greased 9x13 inch baking dish. Bake for one hour, stirring every 15 minutes. Cabbage ready to go... Check! Whisk together 4 cups of flour, the sugar, salt, and baking soda into a large mixing bowl. Using your fingers work the butter into the flour mixture until it resembles coarse meal, then add in the currants. Transfer dough to a large, lightly greased baking sheet. Use a serrated knife, score top of dough about an inch and a half deep to make a cross. Bake until bread is golden and bottom sounds hollow when tapped, about 35-45 minutes. Check for doneness also by inserting a long, thin skewer into the center. If it comes out clean, it's done. Preheat oven to350 F. Grease and flour a 12 cup bundt pan. Sprinkle nuts into bottom of pan.Combine remaining ingredients in large mixing bowl. Beat four minutes on highspeed, pour into pan. Bake 45 to 55 minutes until a toothpick inserted into thecenter of the cake comes out clean. Let cake cool and invert onto plate. Beat all ingredients in a small bowl until fluffy. All that is left to do is get on the phone Steve and get your friends over, there is some serious eats to be had! Happy St. Patrick's Day! Seriously when it comes to trying new cuisines of course the first thing to do is to to make plans with your friends to go out, maybe try some new restaurant, the next new thing. Of course if maybe if you feel like playing the recluse you may pick-up the phone and try take-out or delivery, right? This is me we are talking about, does something really have to fall out of the sky and hit you to try something new at home? Ok, so maybe I might be pushing it a little bit, I think you get the point. Thought we might go out on a limb, just shy of giving up national secrets, but something worthy of serving up to your friends, or even date night with someone special. I think it's exciting and fun to experiment with a new dish, even that of a new culture. It’s not like I thought they would be terrible, or I wouldn't have bothered. But I found a unique satisfaction in serving a risky dish and having it succeed. I know taking the safe route when having people over, make sure to cook something that you know is delicious and that you’ve made before. But seriously! Experimenting in the kitchen is fun, and it’s better with good company. So take the leap of faith, the worse that could happen, you can be a success! Trim fat from beef or chicken. Cut into strips about 3 inches long and 1/2 inch thick. Refrigerate until needed. Combine remaining ingredients in blender, and puree until smooth. Pour over meat, and mix to coat evenly. Marinate at least 1 hour or overnight. Preheat grill or grill pan until hot. Thread a piece of meat lengthwise on each skewer, and grill until done, 2 to 3 minutes on each side. Baste occasionally with marinade during cooking. Serve immediately with peanut sauce. 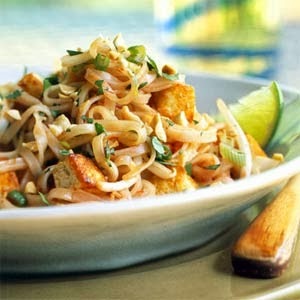 In a blender or food processor, combine peanut butter, oil, soy sauce, garlic, sambal, and sugar until smooth. Add lemon juice to taste. With machine running, add coconut milk or water until sauce reaches desired consistency. Garnish with scallion slices. Serve. Steep the tea leaves and spices in boiling water for 5 minutes. Pour the water into a pot through a strainer to remove the leaves. Add the sugar and stir until it dissolves. Mix in the condensed milk, and then cover the pot and allow the tea to cool to room temperature. 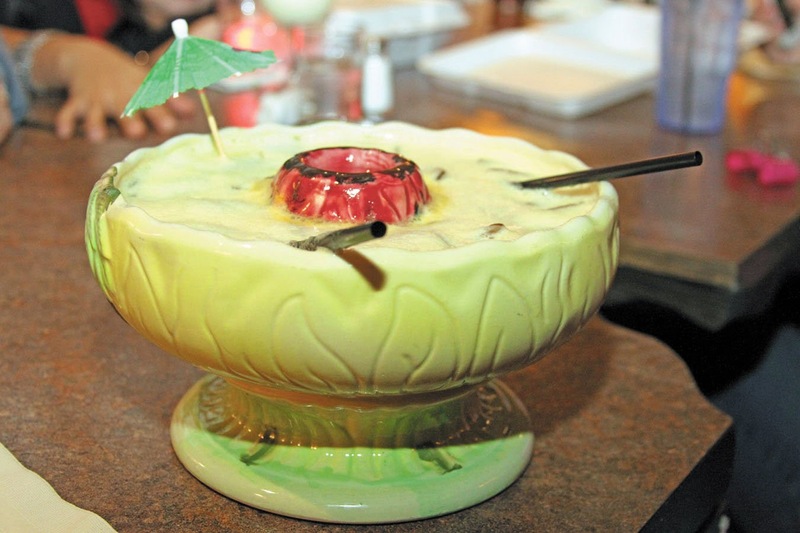 Top off the drink with evaporated milk, whole milk, half and half, or coconut milk. Serve immediately without stirring. Bring water to a boil in a medium-sized pot. Place the tea leaves, cardamom pods, cloves, and star anise in a tea bag or tea infuser. Once the water has boiled, reduce it to a simmer. Add the leaves and spices, making sure that they are fully submerged in the water. Allow to steep for 5 minutes. 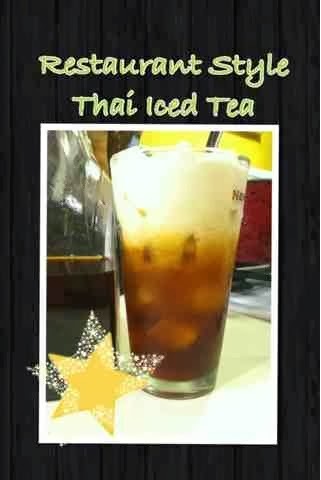 Then remove the tea bag/infuser and add in the star anise powder, vanilla extract, sugar, and sweetened condensed milk. Stir the mixture until the sugar dissolves, and then allow it to cool to room temperature. Serve in a tall glass with ice. Pour the tea over the ice, leaving some room at the top. Add the evaporated milk and serve immediately without stirring. Cut the pineapple in half lengthwise. Hollow out each half, leaving the shells intact and setting the pineapple pulp aside. Put the shells, hollow side up, on a baking sheet and bake until the excess moisture has dried out, about 10 minutes. Remove from the oven and set the shells aside. Meanwhile, coarsely chop enough of the reserved pineapple pulp to measure 1 cup. Set aside. Reserve the remaining pulp for another use. Preheat a wok or deep-fry pan over medium-high heat. When the pan is hot, add the oil, salt and garlic and stir-fry until the garlic is light golden brown, about 30 seconds. Increase the heat to high, add the shrimp and chicken, and stir-fry until the shrimp turn bright orange-pink and the chicken is cooked through, about 2 minutes. Crack the eggs into the pan over the shrimp and chicken and break up the yolks with the tip of a spatula. Cook the eggs, without stirring, until set, about 30 seconds. When the whites turn opaque, add the crab paste and ketchup, stir once or twice, then toss in the green onions, cooked rice and fish sauce. Break up any remaining clumps of rice and stir-fry to mix and evenly season the rice and to heat it through, about 2 minutes. Add the reserved chopped pineapple pulp and toss and stir to heat through, about 1 minute. 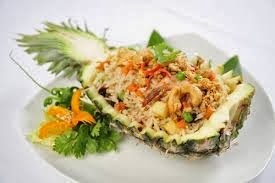 Transfer the rice mixture to the pineapple shells, heaping it attractively. Garnish with cilantro leaves and fried shallots. Serve immediately. Bring a pot of water to a boil and switch off heat. Soak noodles in the hot water for 4-6 minutes, or until limp but still too firm to eat. Drain and rinse with cold water. Tip: Noodles must be under-cooked at this stage in order to come out right (they will finish cooking later when they are stir-fried). 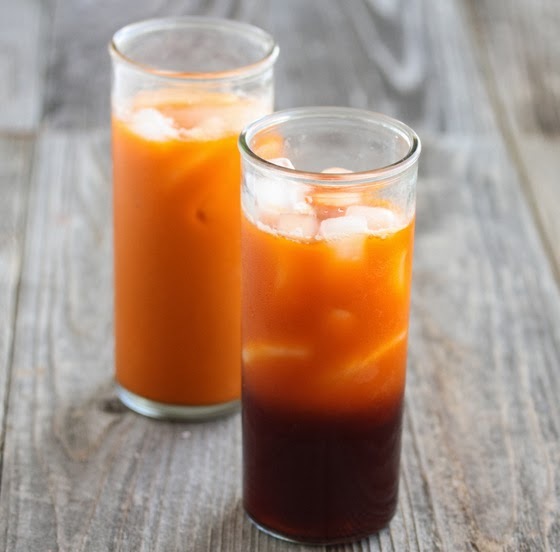 Combine 'pad Thai sauce' ingredients in a cup, stirring well to dissolve the paste and sugar (note that if your tamarind paste is thick, only add 1 Tbsp. If thin/runny, add 1.5 Tbsp). Note that this sauce should have a very STRONG-tasting flavor that tastes sour-sweet first, followed by salty and spicy. Set aside. Warm a wok or large frying pan over medium-high heat. Add 1-2 Tbsp. oil plus the white parts of the green onion (reserve the rest for serving), garlic, galangal/ginger, and chili. Stir-fry 1 minute to release the fragrance. Add the bok choy plus stock. Stir-fry 2 minutes, or until bok choy is bright green and slightly softened. Push ingredients aside and add 1/2 Tbsp. more oil to the center of the wok/pan. Add the egg (if using) and stir-fry briefly to scramble. If pan is dry, push ingredients aside and add a little more oil to the middle. Add the drained noodles and 1/3 of the sauce. Keep adding sauce and continue stir-frying in this way 3-6 more minutes, or until sauce is gone and noodles are soft but still chewy and a little sticky. Switch off heat and add the bean sprouts, folding them into the hot noodles. Taste-test, adding more soy sauce for more salt/flavor. If too salty or sweet for your taste, add a good squeeze of lime juice. If too sour, sprinkle over a little more sugar. To serve, scoop noodles onto a serving platter. Sprinkle with reserved green onion, coriander, and ground nuts. Add wedges of fresh-cut lime on the side. Serve immediately and enjoy! Make a sauce by mixing together 1/2 cup coconut milk, 1 tablespoon sugar, 1/4 teaspoon salt, and the tapioca starch in a saucepan; bring to a boil. Place the sticky rice on a serving dish. Arrange the mangos on top of the rice. 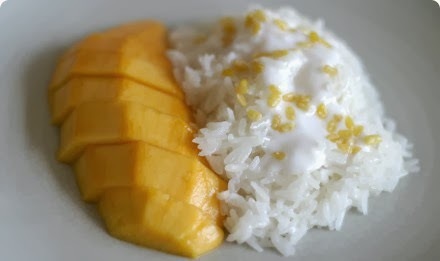 Pour the sauce over the mangoes and rice. Sprinkle with sesame seeds. Now all that's left is to decide when and where to hang out and eat this meal..